Three simple steps to help you find more billfish using satellite imagery.. 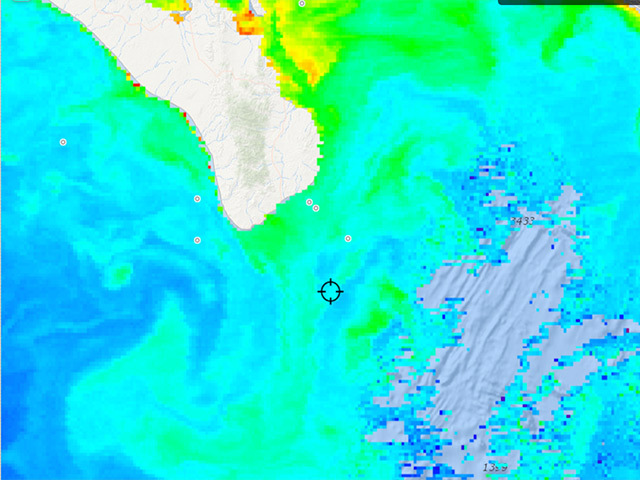 While water temps in the mid to upper 70s look favorable in these images off Cabo San Lucas, viewing a Chlorophyll image taken on the same day shows a large area of off-colored water inshore. Fishermen will have to travel approximately 35 miles SE of Cabo before hitting warm, blue water. Notice how the temperature and water clarity breaks correspond with each other. Although partially obscured by clouds, this shot of Port Macquarie, New South Whales, Australia shows very clean 78-degree water -- perfect for blue and black marlin fishing in the canyons 15 miles offshore. Watch this tutorial to help you get started using FishTrack's SST tools. For more tutorials, visit FishTrack's YouTube page. Go here to try FishTrack for free when you're ready to get started. Most successful offshore fishermen rely on Sea Surface Temperature (SST) and Chlorophyll imagery taken by satellites for trip-planning purposes. 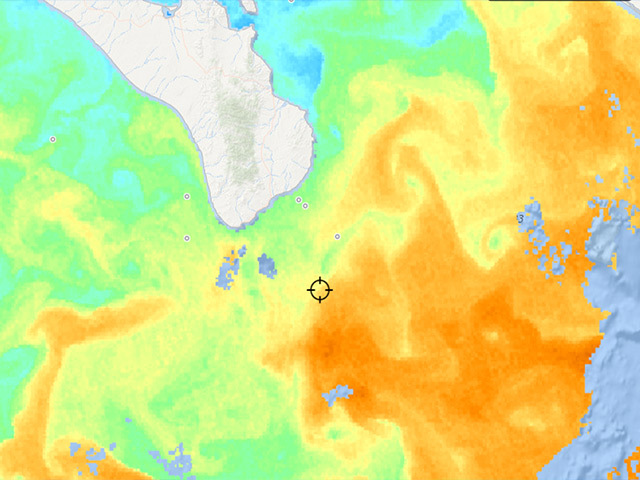 It's a vast ocean out there and SST imagery helps captains locate those areas that are more likely to hold fish. Rather than burning fuel in search of good water, captains can use this modern technology to find potential hot spots before they ever leave the dock. For many recreational fishermen, however, figuring out how to use satellite imagery to identify the best fishing areas is still a bit of a mystery. 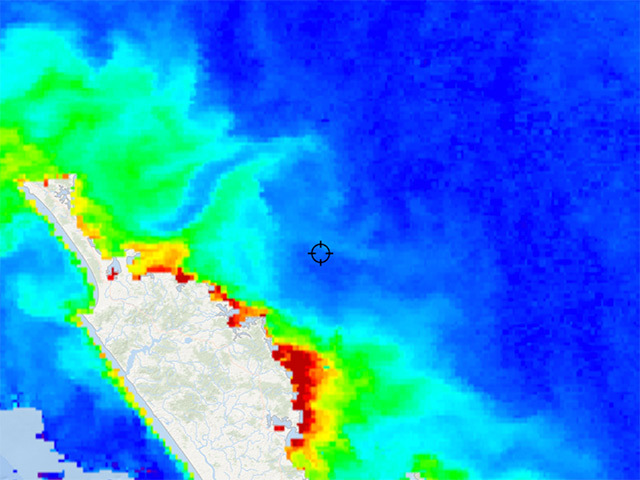 Using SST imagery does not require any advance degree, it's actually pretty straightforward. You just need to know the basics, which are outlined below. Plenty of anglers simply head out to an area where they caught fish in the past or target an area where they heard the fish were biting the day or weekend before. While there's nothing wrong with this approach to fishing, particularly if conditions have remained stable or clouds have prevented any decent satellite imagery becoming available, conditions often change on a daily basis, if not hourly. There is probably another area that might be equally productive where the rest of the fleet isn't fishing and you can find that spot using satellite imagery. With a little practice, anyone can increase their chances of getting a bite by studying satellite charts for a few days before heading out on the water. Click here to try FishTrack for free when you're ready to get started. All of the factors mentioned above play into billfish movements. For this article we're going to simplify (perhaps over-simplify) the process and focus on the absolute basics that will help you find more fish. The basics include water temperature, water clarity and structure. Billfish and tuna are found in warmer waters throughout temperate and tropical regions around the world. This won't come as a surprise to anyone who fishes for billfish, but in temperate regions such as the Northeast, California or Mid-Atlantic for example, water temperatures can fluctuate quite a bit with the seasons. Knowing the lowest temperature that typically holds offshore game fish in your area can be very important when planning early or late season trips. White marlin and bluefin tuna, for example, will start to show up in many areas when the water is in the low 70s F, whereas blue marlin will start to appear in numbers when the water temperature hits the mid-70s. Knowing these preferred water temps will come into play when studying SST imagery. Always start your search by looking for water temps in your area that are warm enough to hold your target species. A quick glance at the SST charts will provide accurate surface temps. Once you've identified an area that should hold billfish temperature-wise you should now take into consideration water clarity. You can get an idea of how clean water in a specific spot is by viewing the latest Chlorophyll images. Chlorophyll is the green stuff found in plant leaves and phytoplankton (tiny plant-like microorganisms). Phytoplankton is the foundation of the ocean's food chain. Bait that large pelagics eat either feed on phytoplankton itself or the small organisms that feed on phytoplankton. 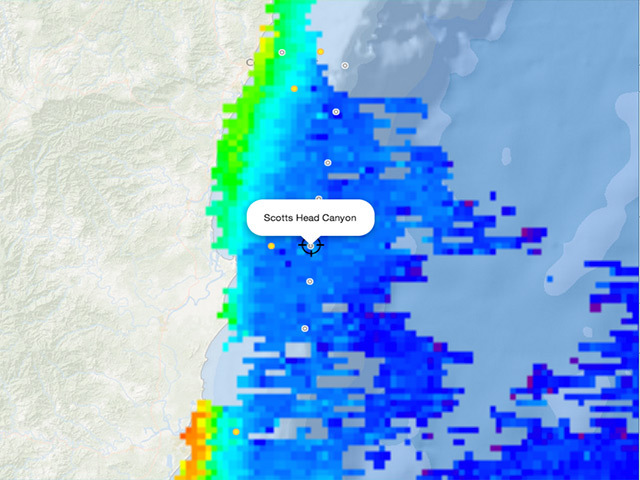 Knowing where phytoplankton blooms are concentrated will give you a really good idea of where baitfish should be concentrated, especially when these areas have been in the same place for several days, which will allow the food-chain a bit of time to develop. Billfish prefer cleaner, bluer waters while concentrations of bait will often be found feeding in the greener, off-colored waters that teem with smaller organisms. The boundary areas between blue and green water, often referred to as color breaks, will typically stack up bait and hold above-average numbers of billfish. Temperature breaks and chlorophyll breaks will oftentimes correspond. So once you've located the general area of a chlorophyll break on the satellite imagery note the temperature difference on either side of this break (for example .2 degrees or 1.5 degrees) and when you arrive at the area you will usually be able to find the break by paying attention to your boat's temp gauge. There's also a good chance you'll start to see other marine life in this general area including birds, porpoise, flying fish and bait. Now this doesn't mean that you won't catch billfish in green, off-colored water, but there's a much better chance you'll find concentrations of billfish in or around the edges of areas where green and blue water interact, or in the blue water itself. Structure is the third critical component to consider when targeting offshore game fish. While you can stumble upon a marlin or tuna just about anywhere in the ocean if the water temperature is high enough, you'll locate more game fish on or around structure. Structure may consist of a hump on the bottom, a ledge, a canyon, a seamount, an artificial reef, an oil-rig or even a buoy or FAD (fish-aggregating device). In the case of large underwater structure such as ledges, canyons or seamounts, deep ocean, nutrient-rich waters and microorganisms will be pushed to the ocean's surface, creating an area where bait will concentrate and hold. Structure such as oil rigs and offshore buoys will also provide both protection and feeding opportunities for bait species and the pelagic fish that hunt them. With that in mind, the basic idea is to try and locate an area where ideal temperature, water clarity and structure are all present. There are three basic tips to help you find more fish with SST imagery. First, confirm that the water temperature is in the range your target species is known to inhabit. Second, identify any areas of blue water on the satellite imagery, especially where clean water is interacting with off-colored water creating a "push" or "frontal boundary." Finally, look for these conditions over an area where structure is present that will attract and hold fish. Find a spot that meets all three criteria and there's a very good chance you'll find some big-game fish to bend a rod. Now that you're ready to find more fish, follow this link to start your free trial FishTrack membership.